Initially founded in 1975 by Steve Girard, acquired in 2000 by Vintner Pat Roney. 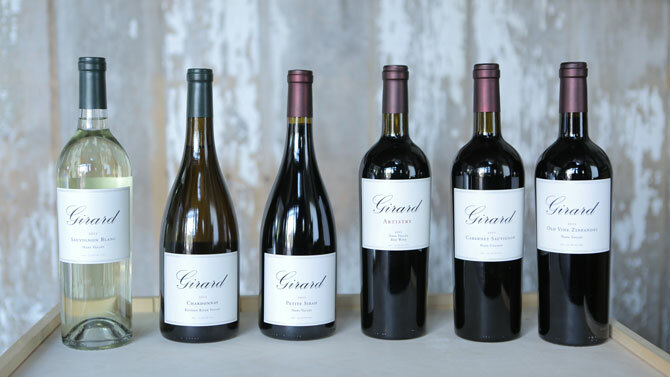 Girard is an ambitious, artisan winery that expresses the character of premier vineyard locations through high-quality, handcrafted, and stylistically diverse wines that match grape varieties with their ideal terroirs. Flagship wine, Artistry, is a classic Bordeaux-style blend sourced from prized vineyards in St. Helena, Oakville, Yountville, and Atlas Peak. Winemakers Marco DiGiulio and Glenn Hugo continue to receive the highest accolades from all corners of the trade press. Girard’s ‘ambitiously efficient’ state of the art winery, located in the Carneros district, was constructed in 2007 and employs cutting edge energy saving initiatives that result in a carbon neutral footprint. Girard’s current production, around 45,000 cases per year from owned and leased vineyards as well as from fruit grown under long-term relationships with highly sought after vineyard sources. With a fanatical focus on every single barrel of wine, Girard winemaking is uncompromising in quality, yet respectful of tradition–best expressed by its Bordeaux-style blend, Artistry. Balanced by Nature. Authentically Napa.